Here in La Ceiba, Honduras, the widely known going rate for a vote in the internal party elections (primaries) this coming Sunday is L.1,000 (US $53). Inflation has struck. The rate was L.500 during the last elections four years ago, though in some parts of the country L.500 will still buy a vote today. 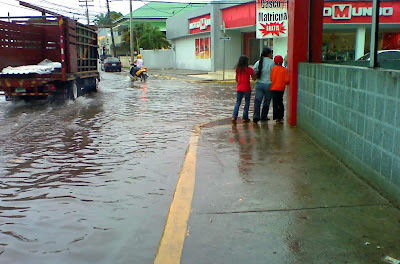 Citizens who protest the corruption by staying at home on election day accomplish nothing. It doesn't even matter if your vote is sold or not, since the parties may steal your ID number and make your vote for you anyway. "Might as well get something out of it" is the usual sentiment. Accusations also abound that the ID cards are sold by government officials directly to the political parties, effectively cutting out the middle man − the voter! Lower level employees are stuck with the odd bribe, disguised as an "expediting fee", knowing that the voter can still make a profit if he receives his card in time. What if you vote your conscience and vote for one of the smaller political parties? That is meaningless, too, as deals have already been struck between the election workers of the various political parties. 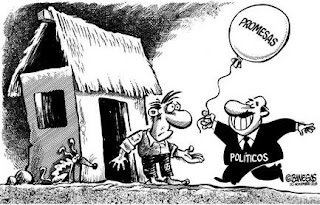 The small parties will "share" their votes among the large Nacionalista and Liberal parties, for a price, of course. I'm not sure of the logistics of this but we aren't talking about a general throwing of political support of behind another party, we are talking about actually using the ID numbers for replacement votes somehow. If you are really a party man, you can vote early and vote often. Honduras has a manual voting system so it is a simple matter to travel around to every polling place within a reasonable distance and vote over and over again. It's hard to depend upon loyal party voters to do this, though, so virtually every bus and truck in the country has been rented by the political parties to transport voters to one or more polling places on Sunday. 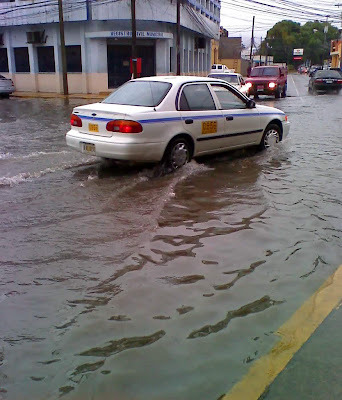 Some drivers are paid by the head that they deliver. In some poor areas only a tamale is required to buy the vote. 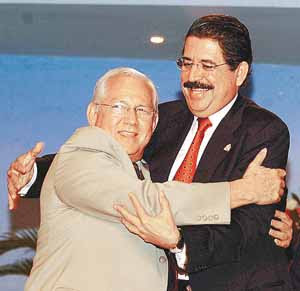 "I'll give you more tamales when I am diputado," says the candidate. And if all of this fails, the ballots or even the urns can just disappear on their way to the polls or on their way to be counted! 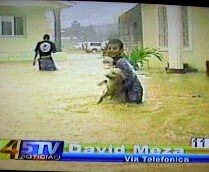 Why would most Hondurans go along with this? Probably not from a belief that their party will change the country, but rather from a belief that as a loyal party member, they themselves will benefit from the corruption, whether it is a car, a job, a contract, a cash payment, a telephone line, or even just a chicken dinner. Most everyone feels entitled to a piece of the corruption pie. And they are considered foolish by their compatriots if they don't take it. 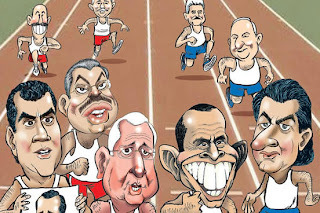 How can Honduras ever become less corrupt if the main requirement, if not only requirement, to win an election is to be more corrupt than the other candidates? 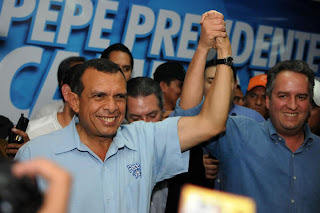 Current President Mel Zelaya even had the gumption to admit to the media that his election was a fraud but justified it by saying that all the elections have always been frauds. I can't wait to read the reports of the international observers who will state that the elections were fair and honest. Twenty-five of them are coming in tomorrow so that should give them plenty of time to figure out Honduras democracy in action. Hah! Idiots. Did I overwhelm you with tips and instructions? I hope not! 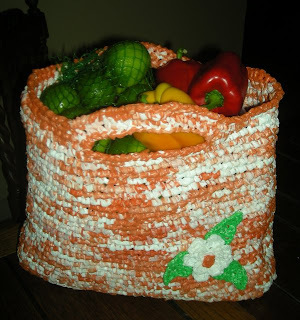 Recycling your plastic bags by crocheting a market bag is not complicated at all. This pattern uses only the single crochet and chain stitches and one slip stitch. Can't get much easier than that, can it? 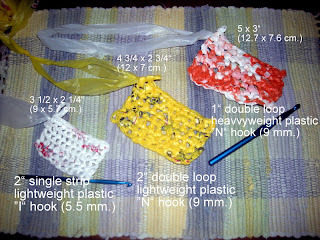 Here is a basic pattern which you can make your own by varying the colors, size, and thickness of your plarn (plastic yarn). 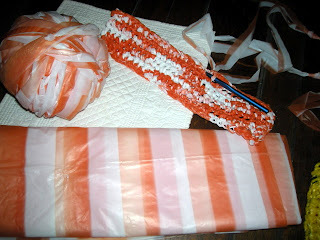 I used the familiar heavyweight orange and white striped Honduran grocery bags cut in 1 inch loops using the square-knot method. BUT, that is not what I want you to do since I wouldn't wish the torture bag on anyone. Please do read the tips linked below before you start. I want you to have a good experience. 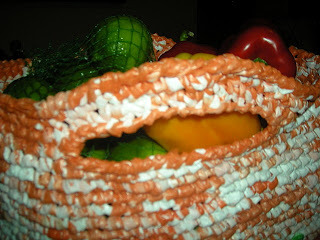 The flimsy, handled grocery bags are much easier to crochet. 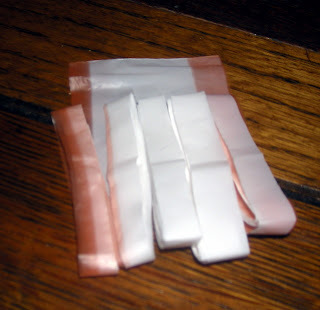 If you are going to use these bags, I suggest using using 1-2" loops with the square knot method, or 1 1/2 to 2" strips using the single strip methods #2 or #3. An N hook (9 mm.) works well with the square knot double loops. A smaller hook, maybe H or I, will work better with the single strips. A very rough estimate is that you will need 50-60 handled grocery bags. If you are going to use a heavyweight bag like a department store bag, cut your loops only 1/2" wide for the square knot method or 1/2 to 1" for the other two single strip methods. 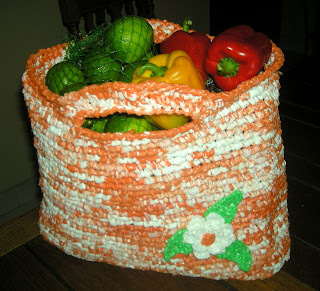 This market bag used 25 18x24" bags (46x61 cm. ), but by using thinner strips, you may need only 15-20 heavyweight bags. Experiment with a swatch so you'll have an idea of how your particular bags and choices will vary in size and thickness. The pattern is easy to adjust even for a beginner, since it is based on inches rather than number of stitches. The swatches in this photo will give you an idea of the effect of different bags and different size plarn and hooks. 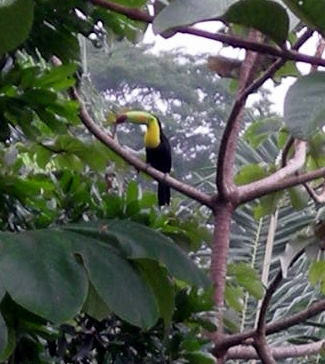 Click to enlarge any of the photos in your browser. *Ch 1, turn, sc in each stitch across. Repeat from *, until the bottom base of the bag is 3-4 inches wide (8-10 cm. ), or the depth that you want. You'll be crocheting with the right side facing you at all times. First round of bag sides: Crochet 1 more sc in the corner stitch, sc in each stitch across the short end, *2 sc in the corner stitch, sc in each stitch across. Repeat from * until you have reached the beginning of the first round. No need to slip stitch into the previous row. Subsequent rounds: Sc in each sc around. Repeat until the sides measure about 11 inches tall (28 cm. 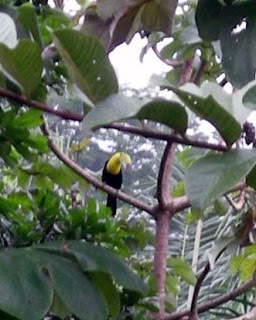 ), or about an inch (2.5 cm.) less than the final height that you want. End at the middle of one of the short sides. Planning the handles: Lay the bag flat and count the number of stitches showing on one side of the top row. Divide that number by 3 to determine how many stitches in one-third of the top edge (12 stitches in my case). Make handle opening: Sc in each stitch across the first one-third, loosely chain 15 skipping the next one-third of the stitches. You'll want the chain to be an inch or two (2.5-5 cm.) longer than the area that you skip. Adjust the length of your chain so that the size of the handle opening is pleasing to you. Sc in each sc in the final third on that side and first third on the other side. Ch 15 (or the number that you have selected), skipping the next third of top of bag, sc in each sc to beginning of round. Form handle: Sc in each sc and each chain around. Final 2-3 rounds: Sc in each sc around until the handle is the thickness that you want. On final round, join to beginning sc with a slip stitch. Pull the end through the loop to finish off. 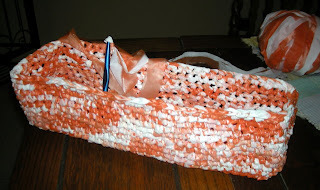 On the inside of the bag, neatly weave in 2-3 inches of the plarn tail using a smaller hook. Cut excess. 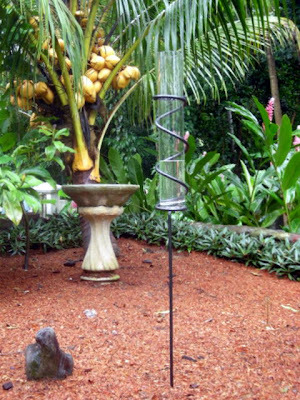 You can quit here, or if desired, make an edging around the top edge and the handle opening using a complimentary or contrasting color. I found that the top edge gaped open a little more than I liked. To "tighten it up" and to give the bag a more finished look by eliminating the chains showing around the top edge, I used a smaller hook (H in this case) and a single 1" wide piece of plarn cut from only the orange stripes of my bag to crochet a reverse single crochet stitch all around the edges. Originally, I tried some other edging stitches but none looked right. They all seemed too heavy and bulky for the plastic that I was using. The reverse single crochet in a thinner plarn seemed to cover the edge best on this bag, though I did have to do two stitches in a few spots to get good coverage. Reverse single crochet is also sometimes called rope edging, crab stitch, or backwards single crochet. It is made by doing a normal single crochet stitch from the front side of your work, but doing it from left to right. It can be a little tricky and if you don't hold your hook right, you'll end up with another row of chains showing at top. Here are two good videos which demonstrate the stitch and show how it should look when completed. Note how loose they hold the loops on the hook. You can also decorate the bag with something cute or kitschy, like a crocheted flower, star, snowflake, silk flowers, decorative buttons, or whatever strikes your fancy. Use a large blunt needle with upholstery thread or fishing line to attach it to the bag. Enjoy! And if you have any questions, leave a comment and I'll try to answer right away. I'd love to see your finished bags so if you can send me a photo, that would be great. By special request, in a later article, I'll post the basic instructions in Spanish, too. Need more plastic bags! Must have plastic bags! Plarn is a clever name for plastic yarn. 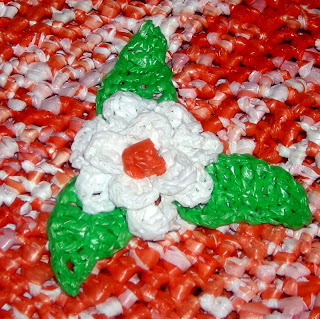 Plastic isn't really anything like yarn, but the name incorporates the idea that you will be using it for needlework, as strange as that sounds. Before you start cutting, be sure to read the tips in "Tips for avoiding the plastic torture bag." Most importantly, before cutting up all of your plastic bags, cut just a few first and make a small swatch to see how comfortable it is to work with and whether you are getting the size and thickness that you want for your project. So how do you get from this (your stash of plastic bags) to the plarn shown above? Gather up your bags, a pair of scissors, and a ruler or yardstick. 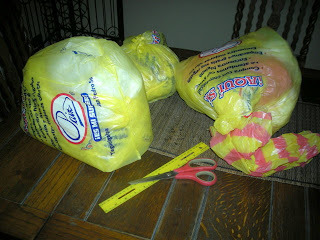 Here are step-by-step instructions to cut plarn in three different ways. 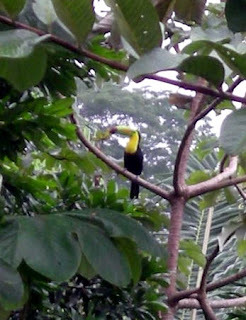 Click on any of the photos to show them larger in your browser window. The first method results in a double thickness of plastic so keep that in mind when determining the width to cut the plastic. I don't recommend this method for heavyweight bags. 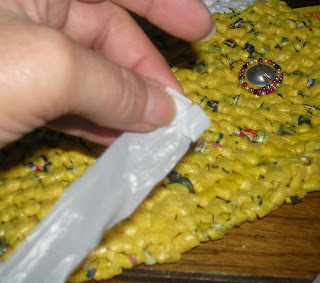 This method is a little faster to cut and after knotting about 10 bags, you'll become a knotting machine and have them connected in no time. Lay down one bag, smooth out the wrinkles and squeeze out the air by running your hand over it from the bottom seam to the top. Fold neatly into thirds. Cut off the bottom seam and the handles, if any. Fold in half or thirds again so that you have a thickness that will be easy to cut. Lay the folded bag against a yardstick and with scissors make snips to mark your desired cutting lines, for example, every inch or two inches (2.5 or 5 cm.). Even quicker is to snip only every other cut. 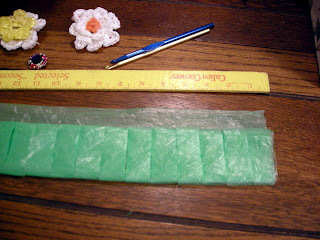 Pick up the folded bag and hold it carefully to finish cutting the strips apart, eyeballing where to make the center cut if you only marked every other cut. The plastic will slide around a little but don't worry if your strips are not all the exact size. You'll end up with a pile of loops like this. If your plastic bags vary slightly in color or opacity, connect them together randomly so that the difference won't be noticeable. If they are significantly different, you could ball them separately for a striped project. The loops are connected by making a square knot. No tails to deal with later! Shake out the loops. Place the end of loop #1 on top of loop #2. 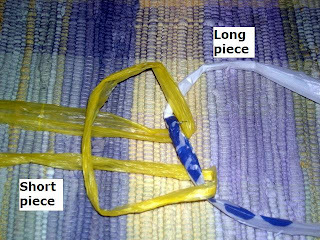 In this photo, I'm calling loop #1 (white and blue) the long piece and loop #2 (yellow) the short or new piece. If you've already joined several pieces or have starting making your ball, this will be loop #1 and it will be your stationary side. Pull the end of loop #2 up and over loop #1 back toward itself. Feed the other end of loop #2 through the loop you've just made. 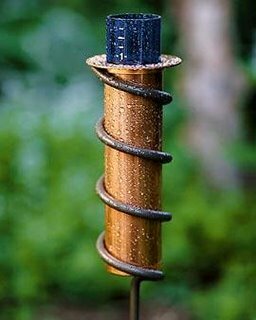 Now you see why the "long" piece is stationary. 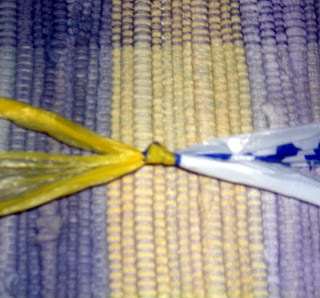 It is much quicker to pull one length through to make the knot than to have to pull a long length of plastic. Pull gently and evenly to make the knot. Tip: I found that by keeping my thumb in the loop as I pulled helped to make a neater knot. Pull out your thumb just before you finish the knot. Leave the knot slightly loose as it may need adjustment later as you crochet. Tighten it just before you crochet that section. It may be hard to believe, but the knots are really not noticeable in the end product. Don't worry. After you do a few of these, it goes really fast. The second method cleverly results in one long piece without knots or joining but requires a little bit more careful cutting. 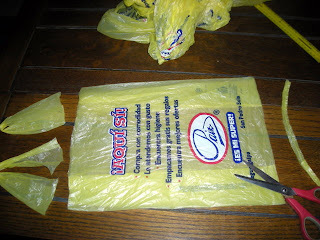 This method is especially good for heavier weight plastic, like department store bags. You could also crochet together two or even three thin strips of different colors for a tweedy or variegated look, but that would probably only work for the thinner plastic and you might want to cut only 1/2" (1.25 cm) strips. Start preparing the bag in the same manner as above (smoothing and folding) but leave about an inch (2.5 cm.) unfolded at the top. Mark and make your cuts but do not cut into the one-inch area at the top of the folded bag. 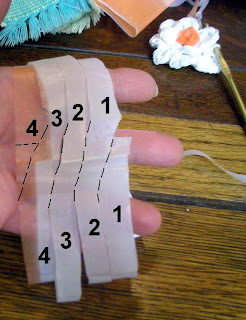 When you have made all the cuts, shake out the plastic, leaving the cut loops dangling and spread the uncut area over your left hand. Make an angled cut from the left cut edge of loop #1 at the bottom of your hand to the right edge of loop #1 at the top of your hand. Make the next cut from the left cut edge of loop #2 at the bottom of your hand to the left cut edge of loop #1 at the top of your hand. Continue in this manner until you have one long strip. It's hard to describe but easy to decipher if you look at this photo. The third method can be really tedious but I liked it when cutting thinner pieces for the trim work as the knots were virtually indiscernible. This method worked well for all weights of plastic and for odd parts of the bag and flat pieces of plastic that wouldn't work using method 1 or 2. Prepare and cut the plastic as in method #1 above, cutting to the desired width and the longest lengths that you can. 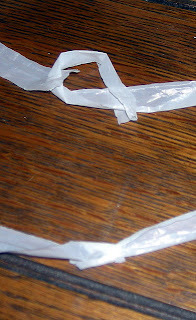 Fold over about a half-inch (1.25 cm) of the end of one strip and make a short snip in the center of the fold, being careful not to cut through to the end of the plastic. Do this at each end of each piece. Fold one end of the short strip in half lengthwise and poke it through the snipped hole on the long strip (step #1 in the photo) − like you are threading a needle. Pull it through a couple of inches and then fold the other end of the short strip lengthwise and thread it through the hole at the opposite end of the same strip (step #2 in the photo). Pull the short strip completely through the eye. Carefully push the "knot" down and tighten it only enough so that it won't be bulky (step #3). Here is a closeup in case you are having trouble following my instructions. 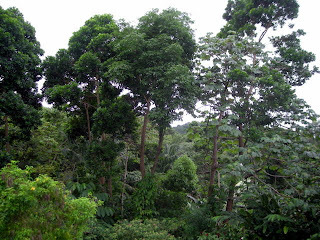 The long strip is on the left and the short is on the right. This method makes an almost invisible knot which is good for trim areas or decorations where square knot might be too bulky and a knot with tails would be more noticeable. It can also be used for joining pieces made using method #2 above, but remember that you will have to pull the entire length through the "eye". 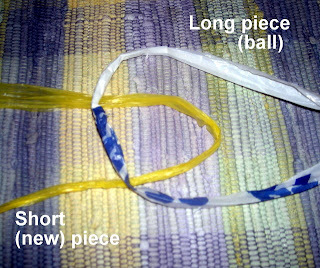 After you have a long length of plarn, or as you are connecting the pieces, roll it up into a ball. I like to roll mine in balls of 10 bags so that I have an idea of how many I've used and how many more bags I'll need. This also helps to estimate your bag needs on a future project. The yellow ball in the photo at top was 10 bags and the orange ball was only 5. That should have tipped me off that I was getting into the torture bag. 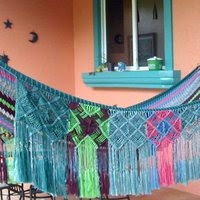 All of these methods can also be used for rag crocheting as well. From the information I've been getting from my readers lately, plastic bags may be becoming extinct in some areas! That's great for the environment and I'm very happy to hear it. I imagine that it will be 50 years before that happens in Honduras, but I'll happily switch to rag crocheting if it does occur in my lifetime. I call this my torture bag as it was pure torture making it. I swear that I'm not exaggerating. If I wasn't so stubborn, I would have never finished this bag. After crocheting for about an hour, my hands and fingers would ache so badly. I measured the height about every inch asking myself, is it done yet? This plastic is heavy and even though I cut it half the width (1" [2.5 cm.]) of the flimsier bags, it was still too thick. Since I had already cut all the plastic in advance (not following my tip below), I was stuck completing the bag with this same size plarn. Thankfully, El Jefe gave me some fabulous hand and finger massages to try to ease the pain. 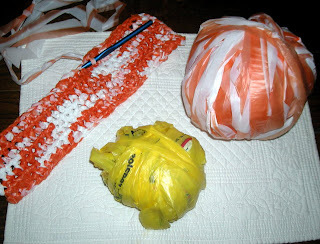 Originally I thought that the yellow and white flimsy grocery bags were a little painful to crochet. After doing the orange bag, I realized that those flimsy bags were much easier. When using two types of bags that are almost the same color, but not quite, I'd suggest alternating the strips in a random manner as you make the balls of plarn. Making several rows of one shade and then several rows of another slightly different shade or opacity will be noticeable − unless that is the look you are going for. 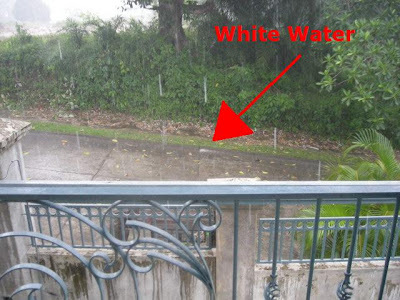 Even white is not always the same white as shown in the photo below. Stick to one thickness of plastic if you can. The size and thickness of the stitch will vary with the weight of the plastic, even if the strips are cut to the same size. You might be able to adjust for a heavier plastic by cutting it slightly narrower. Or try mixing the two weights of plastic together randomly as mentioned above. The unused parts of the plastic bags can be used to stuff toys or outdoor cushions. If the pieces are stuffed into a plastic bag before stuffing the object, it will be semi-waterproof. If the bags are really dirty (like fast food ooze or a fried chicken smell), wash them first and hang to dry. 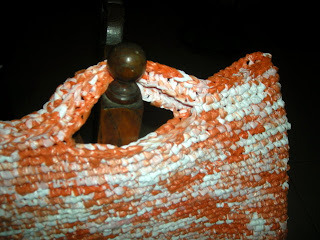 Once the strips are crocheted, any gunk in the bag will be sealed up inside the stitch − not nice. Otherwise, I didn't bother to wash them. When preparing to cut, lay the bag flat, smooth it from the bottom seam up to squeeze out the air, and fold it neatly. This is just to make your cutting easier and more accurate. Any wrinkles in the bag will not be noticeable in the finished project. 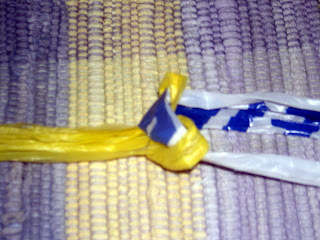 There are three basic ways to cut and join the plarn (plastic yarn). They each have their advantages and all can be tedious. 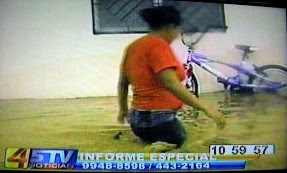 (Cuesta!) 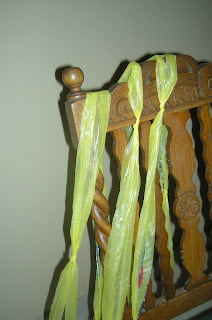 I have so many step by step photos of the plarn preparation that I will include them in a separate article tomorrow. One good idea is to prepare part of the plarn, work on your project until your hands get sore, then give them a break while you prepare more plarn. 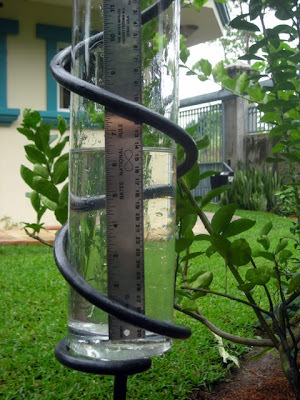 Cut the strips according to the thickness of the plastic and the size of your hook. For example, using an N hook (9 mm. 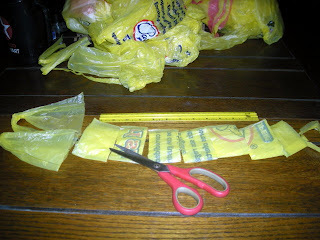 ), I cut the normal flimsy, handled grocery bags to about 2" wide (5 cm.). 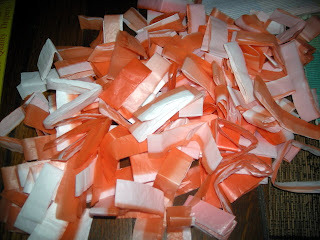 The heavier orange and white standard Honduran bags and heavy department store bags were cut about 1" wide (2.5 cm.). 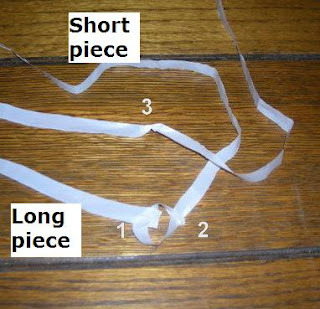 You may cut thinner strips if you will be using a smaller hook. I've started another one using the heavyweight bags and I'm using single 1/2" (1.25 cm.) strips, not doubled − MUCH easier to crochet and the bags go much further! The end product is much more flexible as well. I'm going to experiment with that because I used a ton of bags! The measurements of the strips don't have to be exact. 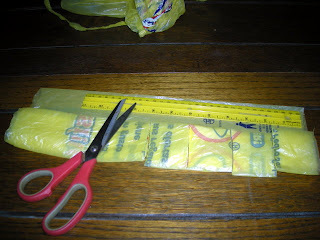 I put a ruler, or even better, a yardstick, on top of the folded bag and snipped a short cut to mark the spots. I then picked up the folded bag to cut the folded strips apart. When cutting 1" pieces, I made a snip every two inches and eyeballed the middle of the snips for the 1" cut. I did the same thing for 1/2" pieces. 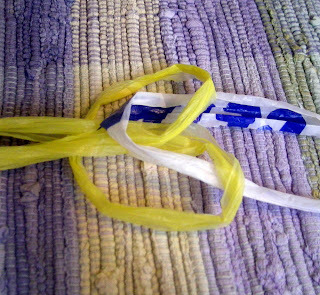 When using the square knot method of making the plarn, keep the knot loose. You may find that the two sides of the loop don't line up after you crochet it. Loosen the knot, adjust the two sides and pull the knot firmly in the center of the two sides just before you crochet it. If you have to tie a knot with tails (least desirable method), leave about 1-2" on both ends to be crocheted in. Shorter ends seem to pop loose and stick out. Crocheting with plastic takes a lot more effort than with more smooth and flexible yarn. After an hour or two at a time, my hands were tired and achy! Make an effort to relax your hands and try to keep an even, but loose tension in your stitches. Don't make your stitches too tight. When picking up the project after a break, make sure that your tension is the same as the last time or you'll end up with a different size. Many patterns call for using a half-double crochet stitch. I found it difficult and tedious to pull three loops through so I used a single crochet stitch. That may be because I generally crochet tight stitches. Half-double crochet stitches seemed an extra effort and extra use of material without much difference in the look or size of the project. Experiment with a small swatch of both stitches to see which is easier for you. If you have to pull out some stitches, do it slowly, helping each stitch come loose with both hands. If you pull too hard, you may weaken or even tear the plastic strips. Once it is crocheted, though, it is very tough. To save storage space and organize your stash, lay 10 similar colored bags together and smooth them out into a neat stack. Fold the stack lengthwise in thirds, snip off the handles, if any, and smooth them again from the bottom up to squeeze out the air. 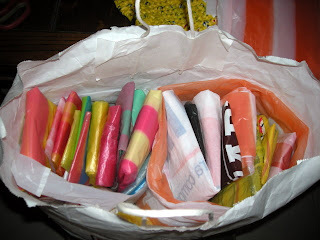 Fold in half and stack the various colored bundles vertically in a shopping bag. You'll be amazed at how much less space they take up. It also saves a lot of time when looking for a certain color or "taking inventory" of how much of each color you have. I roll the plarn into balls of 10 bags so that I have a better idea of how many bags that I will need for future reference on future projects. Keep in mind that the color will be intensified when the plastic is scrunched up in the stitches. 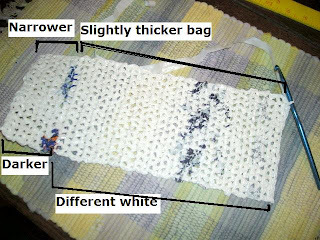 You can see the effect in this photo by comparing the color of the bag with the color of the crocheted project. Most important of all to avoid the torture bag, before you cut up all of your bags, do a practice swatch of at least 4" square (5 cm.) with the size hook, width of plarn, and stitch pattern that you plan to use. You may find that you want to adjust to a different size hook or thinner plarn. It's tough to change the plarn if you've already cut it. I really regret not doing this on my "torture bag."